Luton Town fought back valiantly from 2-0 down to earn a point against Mansfield Town on Saturday. Here’s how the players rated on the day. Marek Stech: 8 - Keeper was Town’s hero at the death as he ensured their hard work wasn’t wasted with an absolutely vital penalty save from Jimmy Spencer. Quickly gaining legendary status in the eyes of Luton fans now. Jack Stacey: 8 - Played a big part in Luton getting back into the game as he flew down the flank and crossed for Collins to score. Becoming an increasingly vital part of Town’s attacking prowess these days. Dan Potts: 8 - With the full backs having to push on in the second half as Town chased the game, Potts did just that and kept his cool to produce a sublime cross for Hylton, as the striker just couldn’t miss. Scott Cuthbert: 7 - Captain was involved in the game’s most controversial moment when despite his protests, he was adjudged to have handled inside his area in stoppage time. On second look, appears to be a very harsh decision indeed. Alan Sheehan: 7.5 - Relished the aerial challenge against Angol with a whole-hearted display throughout as he was called upon to make a number of crucial interventions during a first half where his side found themselves under the cosh for large chunks. Alan McCormack: 6.5 - Was too busy getting involved in a running battle with Mellis during the game as he picked up another booking for an off the ball incident. Sacrificed in the second period as Luton rung the changes in search of an equaliser. Olly Lee: 6 - Like most of Town’s player, couldn’t ever really get into the game in the first half, as Mansfield were on top. Made way around the hour mark as Luton put on fresh legs. 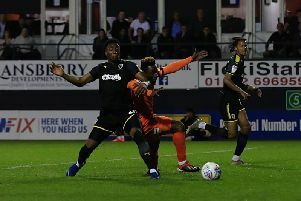 Pelly-Ruddock Mpanzu (STAR MAN): 8 - Driving force in midfield once more for the Hatters during the second half as the visitors finally enjoyed some prolonged spells of possession. Dropped into the holding role and could really have an influence from there. Andrew Shinnie: 6.5 - Couldn’t ever impose himself on proceedings as the Stags got the ball away from danger whenever possible. Looked to roll his ankle in the second period and replaced by debutant Berry. James Collins: 7 - Constant battle with the Mansfield centre halves and had very little joy until the closing stages when Hatters finally started to get round the back of their opponents. Great run to meet Stacey’s cross and tucked it away no problem. Danny Hylton: 7 - Like Collins, was battered and bruised by the Stags defence all afternoon, but to his credit never once reacted and was rewarded by putting his head in where it hurts to make it 2-2. Luke Berry: (SUB): 7.5 - New signing had the final half hour and looked seriously impressive during his time out there, with some astute passing. Glen Rea: (SUB): 6 - Gave the ball away for Mansfield’s second goal as he took a while to get going. Harry Cornick (SUB): 7.5 - Gave Town the pace and directness that allowed them to stretch Mansfield’s defence. Lovely weight of pass for Stacey to pick out Collins too.